Craziest thing, I sat down today to blog the next session/wedding on my list, and it was Kari and Trevor — and today is their wedding anniversary! Now I’m SUPER excited to share these!! Since being pregnant recently myself, I have a new found love for maternity shoots. I’m obsessed with big ole round bellies, but its so much more than that. Maternity photos are the last photos you have with your spouse before it all changes forever. It changes in the best way possible, but still none the less, totally changes. 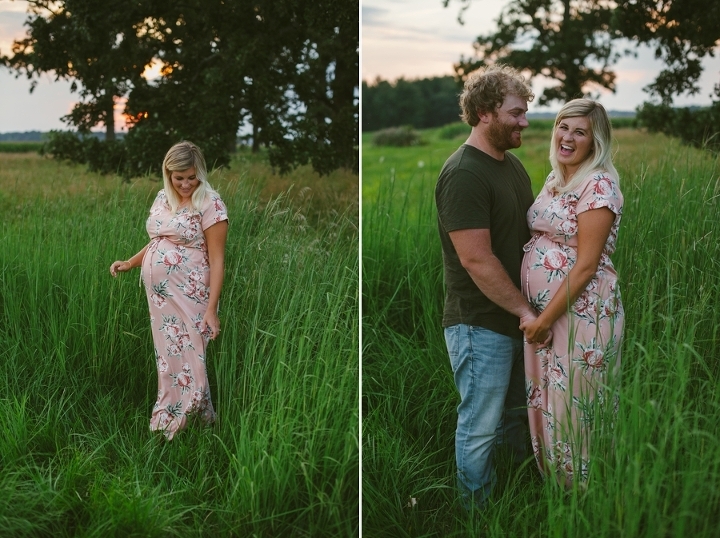 There’s a sweetness to a maternity session, an innocence, a like “we have no idea whats coming and how much its totally going to rock our world” kind of sweetness. How fitting to share these last photos of the two of them together before their family grew by one on their wedding anniversary. Our love for our children is like nothing else in the world… But it all started here. With this love. It’s so important to me that Porter understands the love I have for his Dada. I think Willow will be able to see that she came from such an amazing place of love, respect, and pure adoration for each other just from looking at these photos alone. Congrats on 4 years of marriage, Kari and Trevor!! I absolutely LOVED coming to your home town in nomansland Ohio and photographing this once in a lifetime time for you. Willow (who is now 7 months old!) is absolutely perfect!! Having babies a month apart has been one of the most amazing experiences for me. I love you Kari!! Thank you for always being the best friend! And now, onto the baby fever. A beautiful couple married on a hot July day in Columbus, Ohio. I hope you enjoy their wedding photos as much as I do. My girlfriend Natasha from Perfectly Planned Weddings hosted this gorgeous dinner as a ladies night out (and to fuel her creative passion!) When she asked if I wanted a meal and a beautiful scene to photograph it was an immediate YES. This dinner was almost a year ago now (blame new mama-hood for just now sharing!) but I still love the images just as much. Some strong and beautiful and successful ladies getting together over a gorgeous outdoor meal, sign me up! Enjoy all the beautiful put together by Natasha and Courtney from Perfectly Planned and Prema Designs! Sarah + Eric married on a hot day in June in Columbus, Ohio. Something that sticks out to me about their day is the sincerity that was all around. Sarah and Eric wrote “we love you because” for each of their guests in their seating chart. I have never seen something so sweet and caring before! These two know how to make everyone in their life feel so special. That love and closeness was felt all throughout their day. I immediately fit right in and felt like family! And Sarah might be the happiest bride I’ve ever photographed. She was over the moon all day long and it was a fun contagious energy to witness. I am so happy for these two who truly deserve each other and all of the happiness in the world! Thank you for allowing me to capture these moments! Congrats again! !